Finding the right solutions based on the right questions – It starts with “What do you want?” or “What do you need?”. As one project is different from another, and some solutions are more suited for specific problems than others, the outcome might differ. Wireless – Leading you to the options you have to find and build wireless solutions. Independent – Leading you to the options to build modules that can run independently form anything else, due to the use of micro controllers, Android devices or the use of a Netbook (which is relatively low on cost and energy use and offers you the most from capabilities to storage and connectivity). Follow the arrows and check the comments like: “Arduino -> But wireless” that represent branches in the options you have. Each choice will lead you closer to the solution that might work best for what you want or need. Compactness – Combining Arduino with XBee will take up some space. But if space (and dimensions) is an issue, you might want to move to very compact solutions like the Poluxu Wixel. Price – Combining Arduino with WiFly or XBee will cost you 50 USD and more. When your solution needs to be cost effective, you might want to use (again) the Pololu Wixels. Further below you will find a summary of the various options. Cost – Bluetooth is not cost-effective when you build your own stuff. Compared to XBee and the Polulu Wixel, you get little value for money: starting with 40 USD for a bluetooth modem only. Relevance – Short and simple: it is old and underdeveloped for tinkerer use. If you want to do wireless IO stuff, XBee is a much better starting point. My overview is not complete. It takes the hardware most popular in my circles or the ones known to me. Keeping it simple – If I try to cramp each alternative in, the schematic will become over crowded without giving you really more info than it does now. 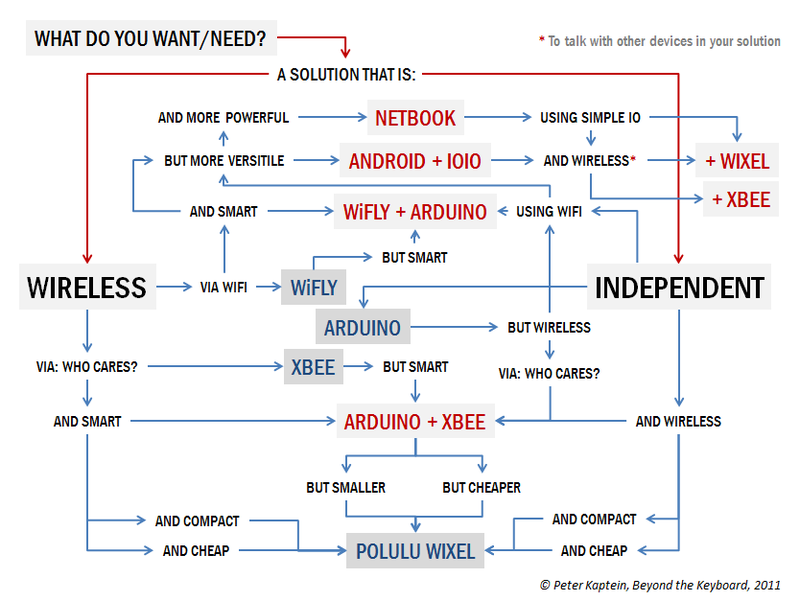 Simply replace “Arduino” or “XBee” with another name if you look for different solutions. My own limited knowledge – This overview is my personal transcript of what I discover and learn. Budget – There might be more solutions in higher price ranges, but due to their price and the availability of cheaper alternatives with the same or more options I discarded them. For each solution given in the overview below, there might be one or more alternatives. Here is an overview of what I can find. NetDuino – Similar to Fez Domino but available from 34 USD (if you want USB embedded). It comes with 14 digital and 6 analog ports. The Maple below might be more interesting as it is close to the same price, but with double the amount of ports. Maple – An 45 USD ARM based micro controller board with the same layout as Arduino. With 128 KB Flash memory and 72 MHz clock speed it is twice the price (44 USD) of an Arduino board and more powerful. It has 39 digital and 16 analog ports. ARMite – An ARM7 based 29,95 USD micro controller with the same footprint (see a pattern here?) as the Arduino Pro. Running at 60 MHz and 32 KB Flash memory. It has 23 digital and 8 analog ports. WiFly alternatives – WiFly combines WiFi and IO. Unknown for now. I googled, but could not find alternative solutions. XBee alternatives – You can find many different XBee modules as the protocol is “open”. Except for the Pololu Wixel I did not do research on this yet. Pololu Wixel alternatives – Unknown. Where the chart might give you a starting point, it does not explain all elements or limitaitons involved. So I wrote a short summary of all possibilities with a brief explanation. It assumes you are already familiar with the basics on Arduino, XBee, microcontrollers and IO stuff. For basic IO you can use the Arduino, the XBee or the Polulu Wixel. Arduino – There are sketches available for Arduino which just plug all read values through to the USB. XBee – The XBee module – by default – is already streaming the data to USB and requires no extra programming. Pololu Wixel – The Pololu Wixel is similar to the Arduino. You need to program it to pass readings from the ports directly to USB. Arduino – If you use Arduino, you need to extend it with a XBee or Bluetooth module and a breakout board to – at least – step down the power levels to that of the XBee. (The XBee runs on 2.5 to 3.5 Volts and will die when attached to more). Pololu Wixel – The Pololu Wixel has its own radio module. XBee – The XBee module is wireless by default. Pololu Wixel – Combines a micro controller with a radio-module. It can therefore send data to other devices and run local processes like the Arduino. With a cost of 20 USD per module it is more than half the price of the combo Arduino/XBee. Android + IOIO – “Android” can be any device, from Smartphones to tablets and Nettops. IOIO is an equivalent to the simple IO boards you can buy for PC’s, with the difference that it works for Android. The combo of Android and IOIO can use WiFi to communicate to the world. Android + IOIO + XBee/Pololu Wixel – When you want your Android device to communicate with and through XBee or Pololu Wixels, you can connect these to your IOIO board and read the data from the TX/RX ports of these devices. The cheapest Android devices cost around 99 euro and include a 600 to 800 MHz ARM Cortex A8 processor. Netbook + XBee/Pololu Wixel – Using a Netbook and a USB connection to either a XBee and/or Pololu Wixel, you can read the streams coming in and send data through these devices to all involved. A netbook adds 200 euro to your equation. It also allows you to run a lot of extra software and store data in databases or on the harddrive. On the low-end side, where a micro controller is enough for a specific (part of your) solution, the Polulu Wixel is the most cost-effective as for 20 USD per module, you have it all. Polulu Wixels do not communicate with XBee. In some cases you might want to use WiFi to do wireless IO stuff to individual modules. One big and obvious benefit of WiFi is that a lot of systems have it built in by default. The big disadvantage of WiFi is the additional cost per module. Where 20 euro is sufficient to run wireless modules like XBees or wireless modules with embedded micro controllers like the Polulu Wixels, WiFi solutions will start at 85 USD per module and only move up in price. Arduino and WiFly – Taken the cost of the combination, moving toward 100 USD, and the limitations of Arduino (it will only do WiFi, has no local storage and no screen) you might move up using Android and IOIO, or drop the Arduino WiFi solution as a whole. Android + IOIO – Android devices come standard with WiFi and are becoming more and more available with low end tablets in price ranges from 99 to 150 euro. The biggest benefit of Android is that it runs Java and that with Java you can build almost anything including small scale Servers. You will start at 150 euro (99 euro for an Android tablet and 45 USD for a IOIO board), but your solution with Android and IOIO is basically running a simple computer with a lot of additional option. From price-perspective I will only mention the solutions that make most sense. Android + IOIO + Xbee/Pololu Wixel – The Android device works as WiFi station. The XBee / Pololu Wixel deal with all nodes in the network of wireless sensors. Total cost per Android + IOIO + XBee will be around 170 euro. In cases where you have a lot of local stuff going on, you want independent solutions which operate without the need of constant data streams. One simple case are solutions to change the color of the light, or dealing with temperature. (almost) all colors in the humanly visible spectrum. The intensity of each color defines what shade you create. One way to define the intensity of the color is by regulating the amount of current runs through it. Another is via pulse modulation: defining the period of time the color is switched “on” and “off”. For LED light, pulse modulation is the most common way. Using dumb modules: If you have a dumb module, like an XBee, that module can only send and receive data. Issue with dumb modules: The pulse-modulation has to be done elsewhere, leading to a constant stream of data, just to control the intensity of light. Using smart modules: A smart module can be an Arduino or a Pololu Wixel. Anything with a micro controller. Benefit of smart modules: You can give the smart module one instruction: “Change color of light to <value>”. The micro controller will then take care of dealing with the exact requirements to change that light. It can change the light directly, but also can do it more organically, using small steps. Dealing with temperature – The basics are very the same as with changing the color of light. The micro controller can take care of specific steps to reduce data transfer and only limit data transfer to very specific messages and instructions. I already covered this in the parts above. NetBook + XBee/Polulu Wixels – Making the Netbook available for other devices with either XBee or Pololu Wixels. The added bonus is similar to Android. I will add articles on specific implementations of these combinations of elements in later posts. Thank you for your post and the flow chart; I appreciate the good things you have to say about the Pololu Wixel. The Wixel is made by Pololu, not “polulu” or “poluxu” as you have said throughout the post and in the flow chart. Thanks for the pingback. I added a brief “editors note” as changing the images cost me more time than I have currently.